Have you ever gone to the grocery store to grab a few items and been shocked at the cost? According to the USDA middle income Americans spent on average $6,224 on food in 2016 representing over 13 percent of their income. It’s even more for Canadians. (sigh) According to Investopia, grocery shopping in the States can be cheaper than in Canadian supermarkets. Meat is a one-third less expensive. Dairy is around 50%, fresh fruits and vegetables can be up to 20%, and junk and convenience foods are one-third less expensive. Any way you slice it, food takes up a significant chunk of a family’s budget. 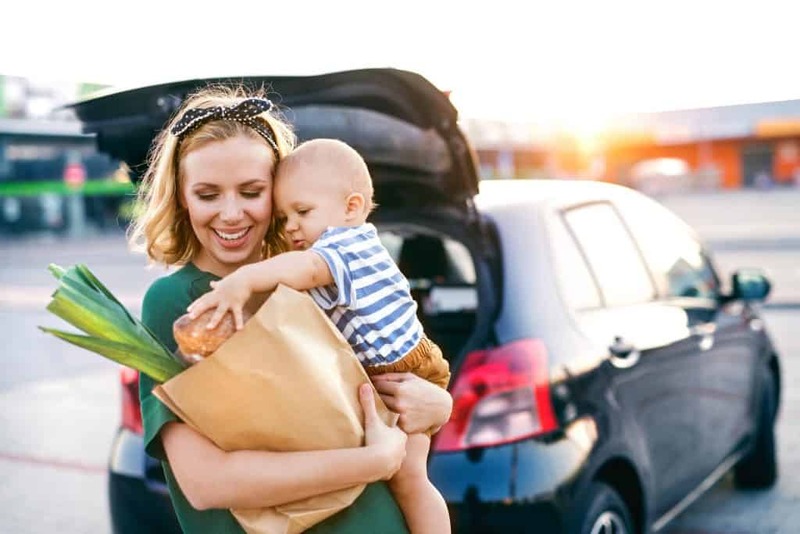 Buying groceries is a necessary and important expense, but there are ways to cut back and save no matter where you live! 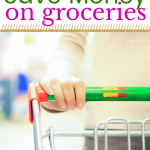 Check out these tips to save money on groceries each month! #1 Create a Plan and Work It!!! 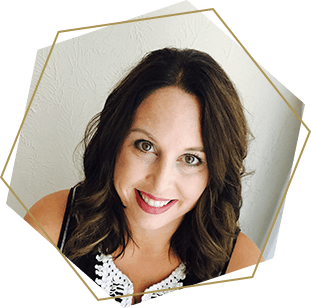 So, if you’ve read much of my blog, you probably know that I’m a “planner.” It’s second nature to me, but I also believe that it can help us to be efficient with our time, more productive in our day and in this case, help our dollars to stretch further. There are a lot of positives about meal planning, but the part I want to focus on here are a few tactics you can use in meal planning. First, consider what items you already have in your freezer and pantry. What meals can you make from them? Next, review newspaper or online ads for store specials. Is there anything on sale this week that would be a great meal for your family? Last, plan 1 or 2 low-cost meals each week. For example, potatoes, dry beans, and rice are very inexpensive. You could do stuffed baked potatoes one night or beans and rice another night. Most stores have cost-saving programs. One store I shopped at in Texas had a weekly meal they would advertise. They had a cooking station set up with a chef who would sample the recipe. You could grab the recipe as well as the necessary ingredients, which were deeply discounted, right at the cooking station. Another store we shop at in Canada runs a different promotion each week if you spend $200. Around Thanksgiving, they give away free turkeys when you meet the threshold. So, I make sure to do one big shopping trip instead of several small trips so that I can take advantage of their benefit. Check out the stores near you and become familiar with their programs. Another way to make sure to save money on groceries is to know the best prices on your most commonly purchased items. This was huge when we had a newborn and were buying diapers. I knew that in our area, the average cost of a single size 0 diaper was about 9 cents. By having this tidbit in my head, when I saw a sale on diapers, I could do the math to see if it was really a sale or perhaps just fewer diapers. 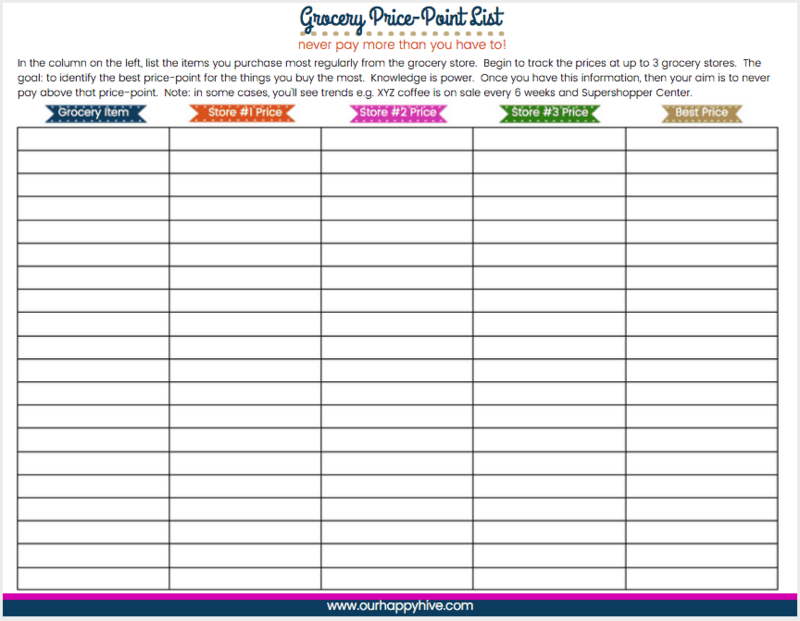 At the end of the post, you can download my template for tracking prices on your most common grocery items. It takes a little work at first, but literally, it will pay off in the end. Ok, so now that we’ve talked about how to plan meals and plan for costs, let’s talk about a few buying tactics. These simple tips can help stretch your dollar further and ensure every month you save money on groceries. Buy generic or store brand items. They are usually just as good as the brand name and in many cases made by the same producers just packaged under a different label. Buy in bulk – typically you get a better price per item when you buy larger quantities. So, if the store is selling 1 can of diced tomatoes or a package of 6 cans of diced tomatoes, usually the unit price per item is less when you buy more. Stock up – when an item is at the lowest price (which you’d know from tracking prices mentioned in the planning section), then stock up if it won’t spoil. We go through a ton of paper towels, so any time I find a good sale, I will buy as many extras as I can fit in my car. We can store these in our basement and it will definitely save us money in the long run. Buy what’s in season – If you buy out of season produce it will cost more. 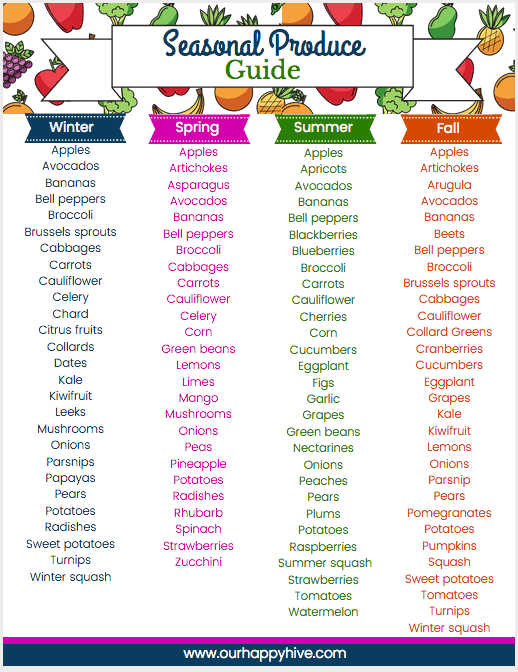 Use my handy Seasonal Produce Guide to make sure your buying fruit and vegetables when they are at their lowest prices. Eat fewer animal products – Dairy, meat, and eggs are costly. Cut them out for one or two meals a week and you’ll help your dollar go further. We went 100% plant-based for a hundred days in 2016 and I was shocked at how much money we saved. Our grocery bill was reduced by 30%. Don’t buy prepared food – foods like salads, meats, or pre-cut fruits/veggies cost significantly more than whole ingredients that are unprepared. It may take you more time to get a meal ready, but you’ll save money. Identify grocery items that can be substituted or you don’t need– As an example; you could substitute glass reusable storage containers instead of plastic bags. In our case, we could try to use fewer paper towels and use kitchen towels instead. Alternatively, things like sodas could be cut out altogether and you could save a couple of hundred dollars a year if you drink them regularly. Don’t shop at only one store. Different stores have different sales and savings programs. It’s easy to get in a rut and go to the store down the street or assume that the “discount” store has the best prices, but if you want to save money on groceries on a regular basis, you’ll need to shop around. Don’t worry, you don’t have to do this too often before you find the pattern and identify where you can get the best prices. As an example, the Dollar Store is a great place to buy products like household cleaners, plastic wrap, or foil. Amazon subscriptions are great for things like pantry items or diapers. Wholesale clubs like Costco or Sam’s are great for some products, but not for others. As a Costco shopper, I’ve found the best deals on produce compared to other local stores. From time to time they also have great deals on paper towels, which is a big saving for my family’s unfortunate addiction. The point is, know the variety of options and find the store with the best price point. If you’re unsure which store has the best prices, use the tracking sheet from my downloads at the bottom of the post and begin to track your most common items. 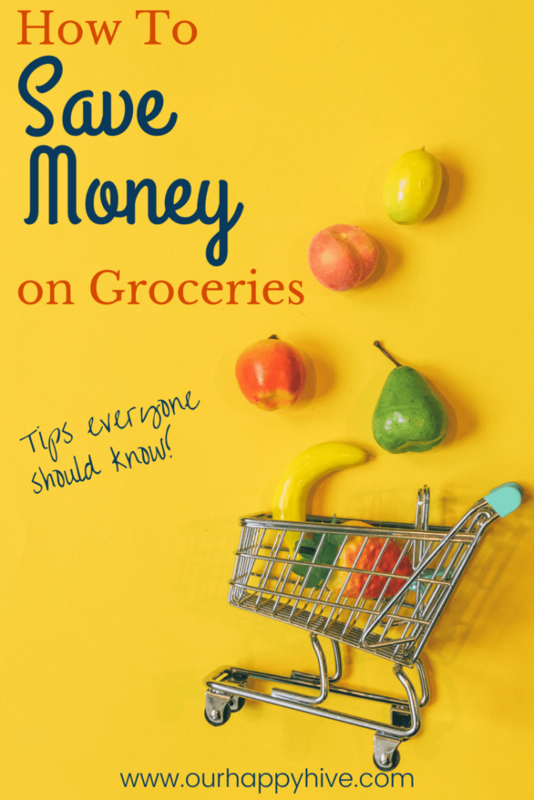 As a busy mom, it’s easy to go for convenience and unintentionally leave some proverbial “money on the table,” but if you want to save money on groceries, use every possible strategy to make your money go further than it has in the past. Here are a few things you can do. Use store loyalty cards – Not all stores have these, but the majority does and when they do, they offer different sales from week to week. Plan your grocery list around these sales and stock up (provided they meet the best price point for your area). Store Credit cards – Many large grocery chains offer a Master Card or Visa for their store where you can accumulate points. We are able to save money every week by making normal purchases and paying off the card. The next time we go to the grocery store, we have $20-60 dollars towards our bill. 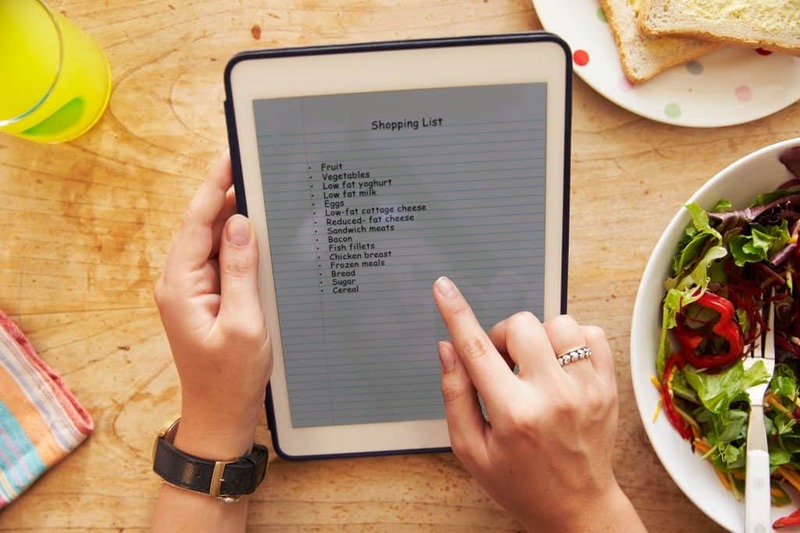 Shop only once a week – In order to do this effectively, you need to have a plan with a grocery list and you must stick to that list. The more frequently you go to the store, the more likely you are to spend more money. Why? Because usually, you go to the store multiple times if you don’t have a plan, which makes it difficult to shop competitively. Also, the more time that’s spent in the store, the more likely you are to put unnecessary or spur-of-the-moment items in your cart. Tell me I’m not alone on this one ladies!!! Sticking to the list is critical if you want to save money on groceries. We realized that when we went to one store, we were more likely to throw 1 or 2 seasonal items in our cart. Before we knew it, we had racked up $50-100 unplanned dollars. Use Coupons – Last but not least, look for and use coupons where possible. There’s no doubt about it, groceries are a big expense! They are also an important expense…one you can’t get rid of all together. 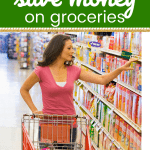 But, there are practical ways to save money on groceries each and every month. Maybe all of these steps aren’t for you or perhaps you feel overwhelmed. If that’s the case, start small. Don’t take on more than you can chew. Pick 1-3 tips to start using in the next few weeks and go from there. By planning ahead, using simple buying tactics, shopping at a variety of stores, and employing savvy shopping strategies you can begin to save today!